The book is primarily meant for the use of Honours and Post-graduate students of Philosophy and Religion of the Indian Universities. Most of the books that are available on the subject dwell more upon the history of the origin and growth of the different religions rather than upon the basic principles, beliefs and practices that these religions inculcate and emphasize. Instead of going into the history of religions the author deals with certain specific topics relating to the important beliefs and practices of the followers of these religions, making the approach topical rather than historical. To make the study really comparative a separate chapter has been added which compares the religions on the specific topics taken up in the book. 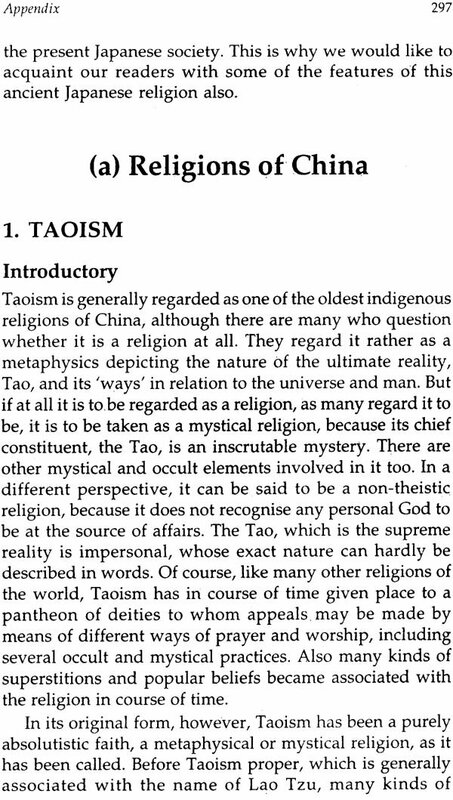 Towards the end the author has attempted to assess the possibility of a Universal Religion. The book is written in lucid style and contains much useful and interesting material for students as well as general readers. 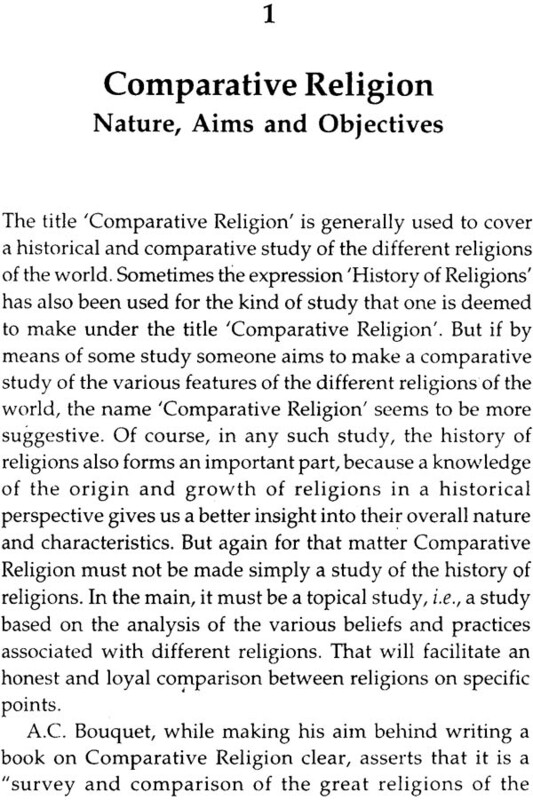 Comparative Religion is a very interesting and important area of philosophical research and study. That is why universities of India are steadily including it as a part of their teaching courses. Dr. Kedar Nath Tiwari has done a great service to the cause of promoting the study of Comparative Religion by writing a book on the subject. His book is written in a very lucid style and contains enough material for initiating students and scholars for further research and study in the field. The aim of a study like this is partly to acquaint readers with the main aspects and features of the living religions of the world and partly to suggest the points of agreement and difference among the different religions. The book very well succeeds in serving both these ends. I am confident that the book will be well received both by students and teachers of Philosophy and also by general readers. 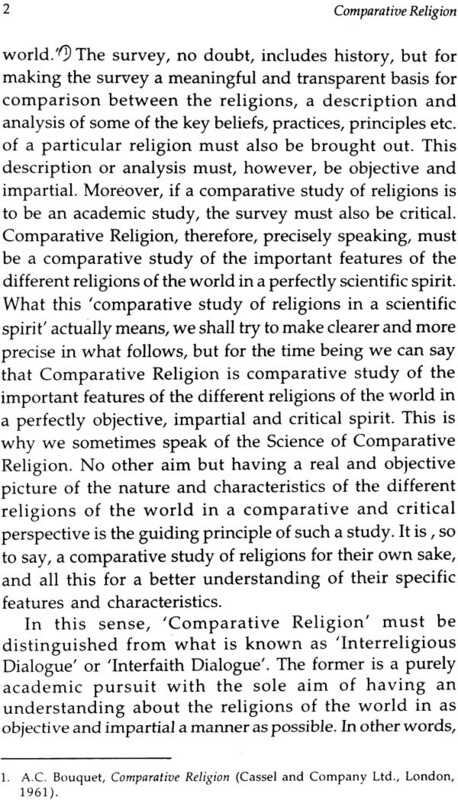 Although Comparative Religion as a subject of serious study has found a relatively late start, it has been realised for quite some time now that it is a very useful and important study. Many universities, both in India and abroad, have therefore included the subject in their academic curricula. Books on the subject are also not rare now. But still I have always felt the need of having a book on the subject which could effectively meet the requirements of the Honours and Post- Graduate students of Philosophy and Religion of the Indian Universities. This feeling of mine has found ample support from the difficulties which they have been reporting to me from time to time. 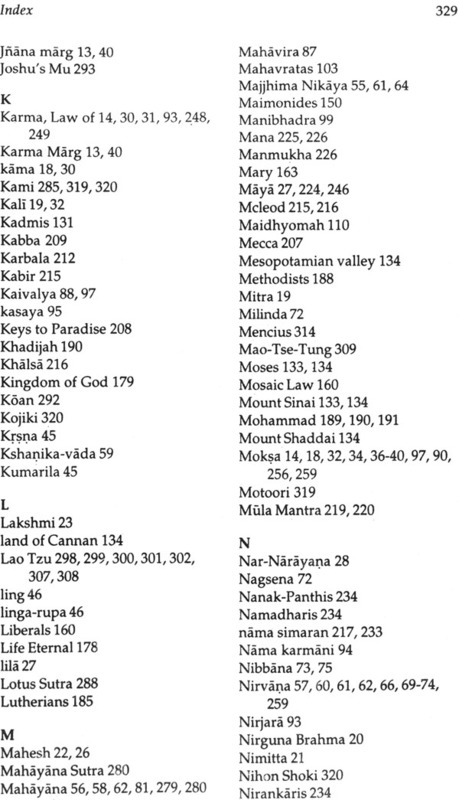 Most of the books that are available on the subject dwell more upon the history of the origin and growth of the different religions rather than upon the basic principles, beliefs and practices that these religions inculcate and emphasise I have, therefore, instead of going into the history of the religions, tried in the present book to deal with them .with reference to certain specific topics relating to the important beliefs and practices of the followers of these religions. My study has, therefore, in brief, been more topical and less historical. Then again, to make the study really comparative, I have added a separate chapter of comparing religions on the specific topics with which I have been concerned here in this book. 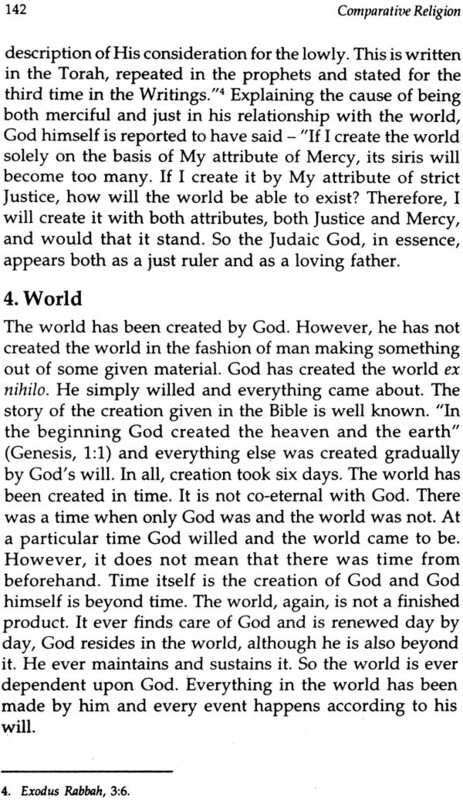 On the basis of these comparisons, I have also made an attempt towards the end of the book to assess the possibility of a Universal Religion, which is being much talked of for some time now by the religionists and philosophers of the world alike. The book is specially meant for the use of the students and therefore moderate critical appraisals also have been made here and there. But general readers interested in the subject will also, I hope, not be frustrated and will find the book much to their interest, use and purpose. I cannot claim that the book will be really useful for those whom it is meant for, but I must hope so. Readers themselves will be the best judges of the merits and demerits of the book and I will be very much obliged to them if they write to me the shortcomings of the book in frank and definite terms. I am really very much thankful to those of my students who have inspired me to write this book for the solution of their difficulties. I am also thankful to Shri Jainendra Prakash Jain, the Partner of Motilal Banarsidass, who very much liked the idea of publishing a book on the subject and asked me to prepare the manuscript. I cannot forget Sri Kamala Shankar Singh, a very sincere and enthusiastic executive of the Patna Branch of Motilal Banarsidass, who played a significant role in initiating the idea of writing a book on the subject and thereafter pursuing relentlessly the task of getting the manuscript prepared by me. Last, but not the least, I must extend my heartfelt gratitude to my elder, Dr. Basant Kumar Lal, who took the trouble of going through the manuscript, making valuable suggestions here and there, and finally writing the Foreword. When the book was first published in 1983, I never thought that it would be as popular as it has actually proved to be. I am proud of saying that the book has been well received not only by the students and teachers of almost all the Indian Universities, but also by readers abroad. I am sorry that although at least four times the book had to be reprinted since 1983, I could not be able to present before my readers a revised edition of it. I am extremely happy to find myself at least now in a position to bring about a fresh edition of the book with several additions, enlargements and elaborations at appropriate places. At certain places where I have felt that some material could be more appropriately presented in somewhat a changed way, I have made the necessary changes. The essential framework of this book, however, remains the same. An idea of the changes made, including the additions and elaborations, may be had from the following. There was no 'Introduction' to the book in the first edition, but the present edition contains a brief 'Introduction'. 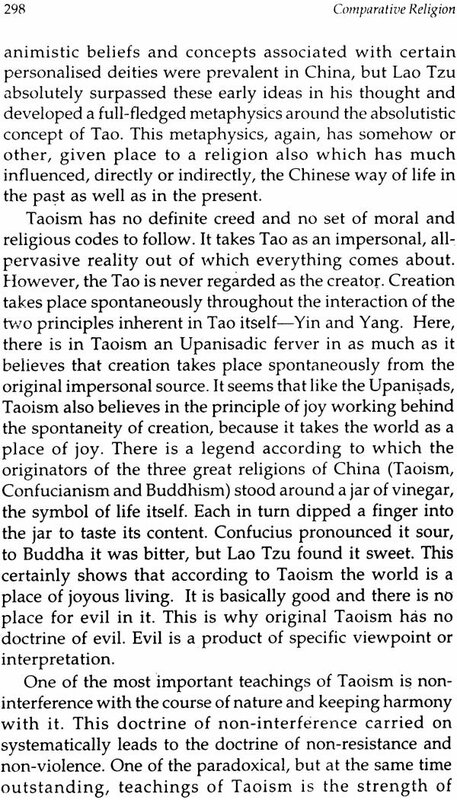 The chapter on Zoroastrianism has been, more or less, rewritten. 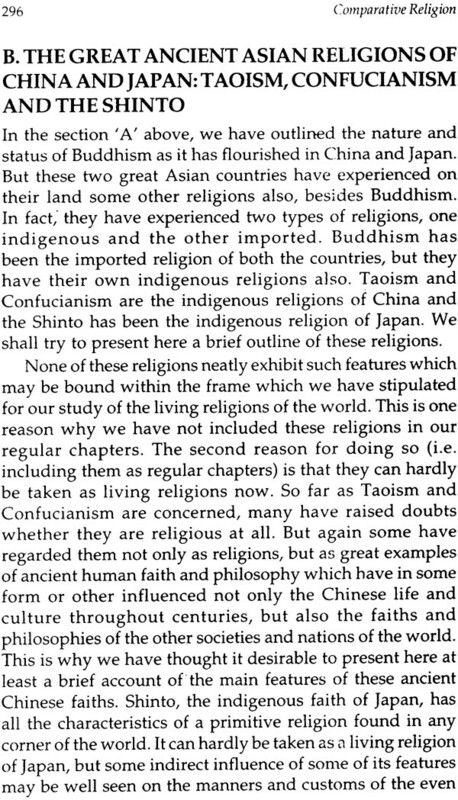 There has been a totally new addition in terms of the religions of China and Japan in the Appendix. Of course, there may be a genuine doubt in the minds of the readers whether any of these religions (except Buddhism) may be regarded as a living religion, still I thought it worthwhile to present at least an introductory idea of these religions before my readers so that they could know at least something about them, which were once taken to be very important faiths of the world and which, in some direct or indirect manner, do not fail even now to influence and shape the life-pattern of the people of the countries to which they belonged. However, I have not thought it proper that they should intrude into the general framework of this book, partly because of the fact that they seem hardly amenable to this framework and partly due to the fact that they are not living. I hope the readers will appreciate my stand. Besides these, many suitable changes at appropriate places, such as, in chapters 1, 2, 3, 4, 8, 9 and 11 have been made. 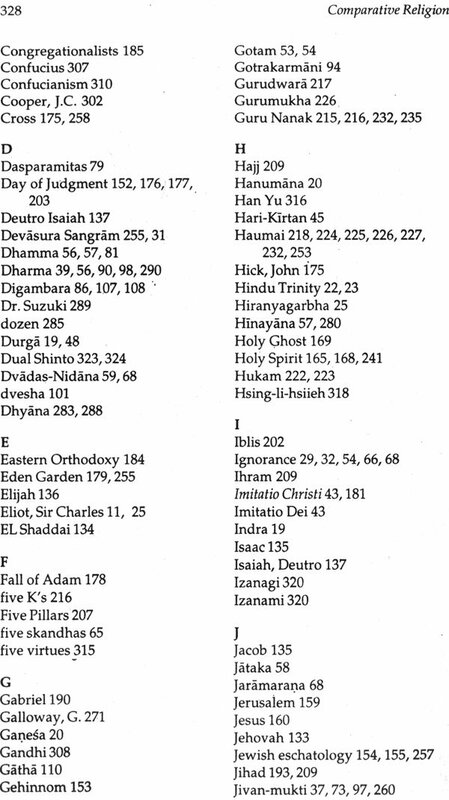 For the convenience of the readers an index of names and subjects has also been added towards the end of the book. I have every hope that the readers will be highly benifitted by the above noted changes and they will receive this new edition of the book with a still greater interest and zeal. Even now there may be spots where changes in various terms might be necessary or desirable. I shall be grateful if such spots are pointed to me by learned readers. That will enable me to do the necessary work of editing in respect of them at any time in future when I find an opportunity to present yet another edition of the book. 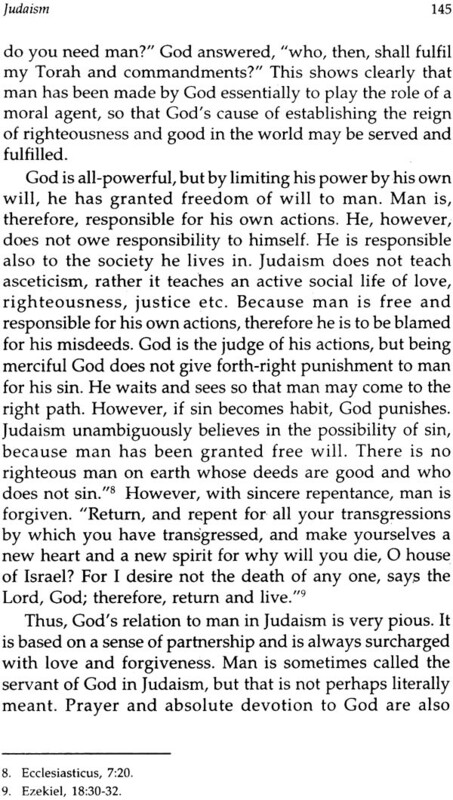 Religion is perhaps the oldest human pursuit, but still no precise definition of it has been finally given till today. We also on our part are not going to give here any definition of religion in some precise terms. We will simply point to the two broad forms of religion, one of which may be called 'individual' and the other 'social'. 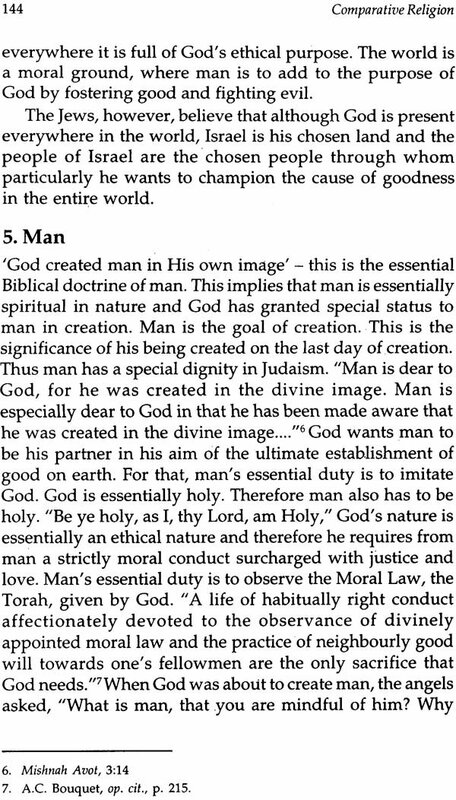 By individual form of religion, we mean that form in which an individual in his solitariness makes silent efforts to establish communion with whatever he takes as divine. It is perhaps by keeping this form in mind that Whitehead takes religion 'as something which an individual does with his solitariness' or Dr. Radhakrishnan takes it as 'the culture of the soul'. By the social form of religion we mean that form under which several people form one religious group by virtue of entertaining, more or less, the same set of spiritual convictions and observing, more or less, the same kind of religious practices, either individually or congregationally. 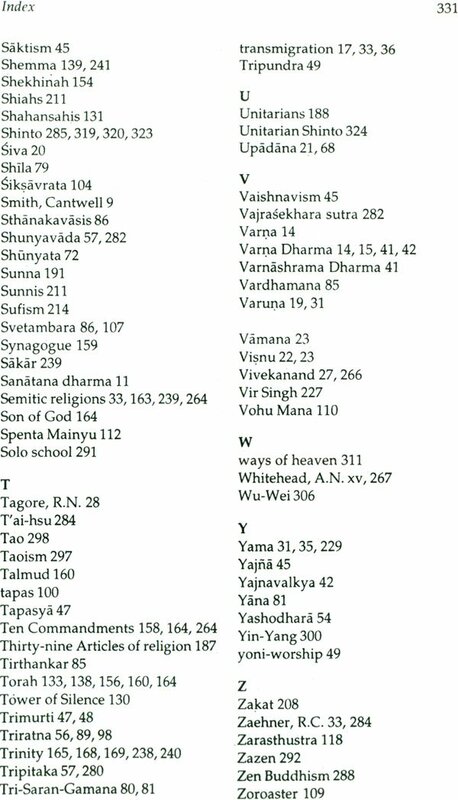 Hinduism, Buddhism, Christianity, Islam etc. are the examples of this form of religion, because each one of them binds several people together in matter of spiritual beliefs and religious practices. We will be obviously concerned here with the latter form of religion, because we are going to make here a comparative study of the prevailing religions of the world, some examples of which have been given above. 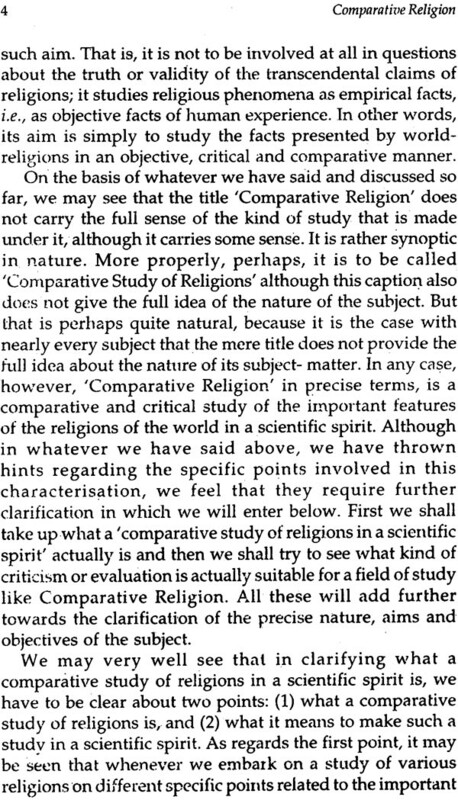 What exactly will be the nature, aim and objective of the kind of study that we are going to make here under the title 'Comparative Religion' will be given in chapter one ahead. But here in our introductory remark we will like to mention that it will be a purely academic and scientific study having no extra-academic aims such as promoting the social value of religions in a fresh perspective or bringing about an environment of mutual understanding between them. We have avoided giving any precise definition of religion, but we will not avoid giving a general idea of the very essential character (or characters) of the prevailing religions which makes them all called 'religion' in spite of some very important differences between them. We may mark, for example, that there are religions like Buddhism and Jainism which do not believe in any God, while religions like Judaism, Christianity and Islam obviously believe in God. But still all of them are called religions alike. 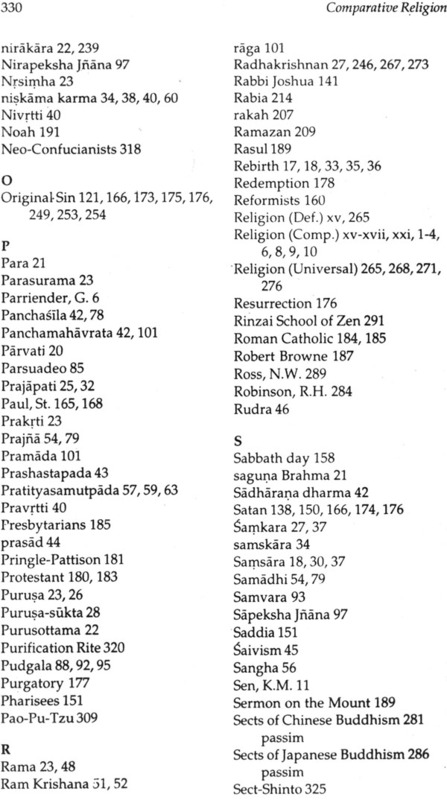 What, after all, makes them all called by the same name 'Religion' in spite of the above important difference as well as some other important differences too? It is perhaps due to the-following two general features possessed by each one of them alike- (1) Each one possesses certain specific convictions or beliefs with regard to the world-and-life situation as a whole and (2) In the light of these convictions, each one prescribes a specific way of life for its followers. It is possible that there are certain similarities between two religions in respect of both the convictions and the way of life, but there may be (and actually are) certain important differences too. It is really due to the specific convictions as well as the specific way of life that a particular religion has in contrast to others that it assumes its specific identity as a particular religion. Having specific convictions and then having a way of life in the light of those convictions seem to be, then, the essential character of every religion. Keeping in view the above two features of every prevailing religion of the world, 'religion' may be most generally defined as 'a specific way of life based on certain specific convictions with regard to the world-and-life situation as a whole'. On this definition, however, even an ideology like communism may be regarded as religion, provided it possesses specific convictions with regard to world-and-life situation as a whole and depicts a way of life for its followers in the light of those convictions. 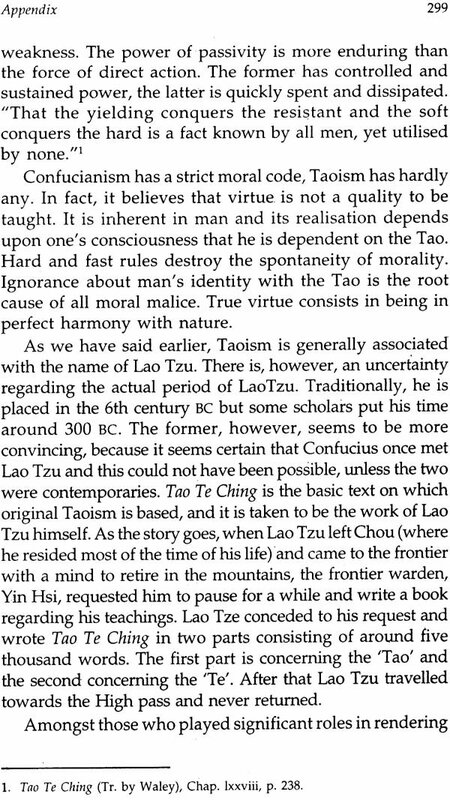 Communism perhaps fulfills both these conditions, and therefore a communist is as much a religious man, as a Buddhist, if the former also like the latter lives up to the convictions incorporated in his ideology. But communism is hardly regarded as a religion. Why? Perhaps because its convictions are all materialistic in nature and it very conspicuously lacks in spirituality which is traditionally regarded as the core of religion. 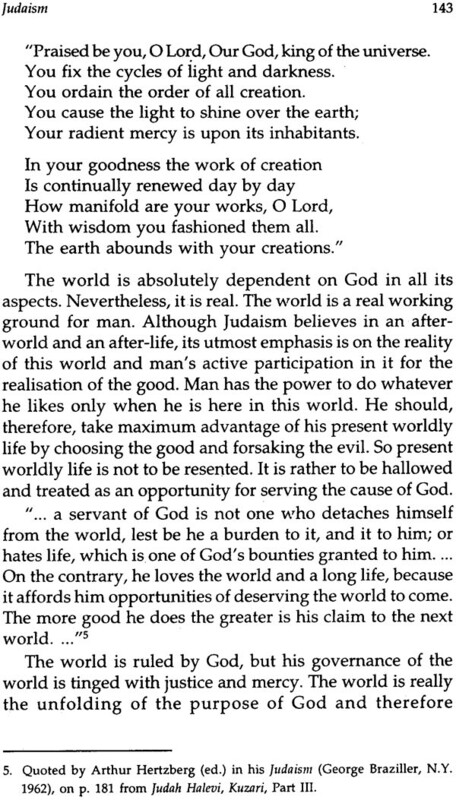 Thus in the light of this essential characteristic of religion, we will have to make the following modification in our definition - 'Religion is a way of life based on certain specific extra-mundane or spiritualistic convictions with regard to world-and-life situation as a whole.' We may very well see that all our traditionally recognised world-religions fulfil this condition. Buddhism does not believe in God, but it believes in a spiritual sphere and a spiritual goal and in the light of its spiritualistic outlook, it depicts a specific way of life. Christianity believes in God, a spiritual reality, as well as in a spiritual goal, known generally as the 'Kingdom of God'. In the light of this spiritualistic outlook, it also depicts a specific way of life. Similar is the case with all other prevailing religions, and hence all of them are called religions. This definition needs a lot more analysis and explanation, but that we are not going to do here for more than one reason. 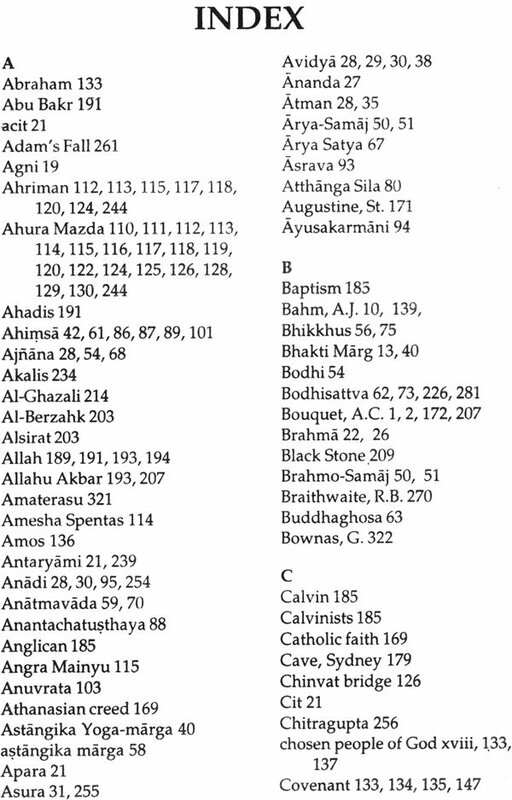 Interested readers may see the author's book The Logic Of Religious Belief (published by the Classical Publishers, New Delhi) in this connection. But whatever is said above gives sufficient hint for the sense in which the prevailing religions of the world are called religions. 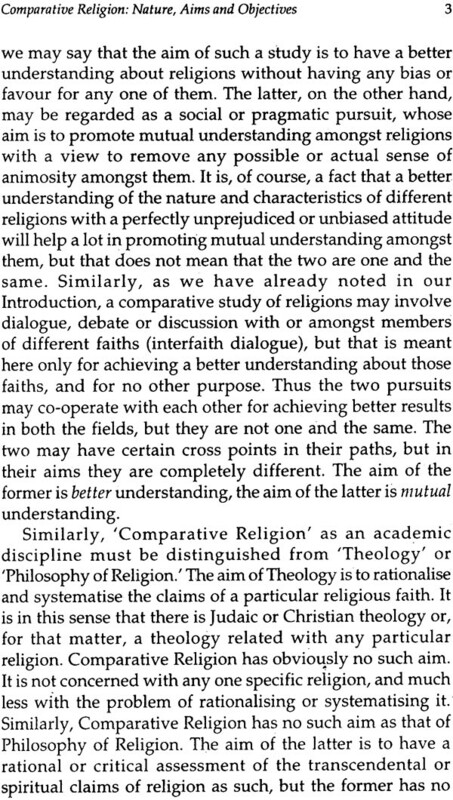 Here under the title 'Comparative Religion', we are going to make a study of the main beliefs (convictions) and practices (way of life) of these religions in a comparative perspective. The subject of Comparative Religion as a scientific study of the various features of the different religions of the world in a comparative perspective is relatively a late development. It is hardly for a hundred years or so that the name 'Comparative Religion' has gained currency and studies in this direction have been taken up in right earnest. 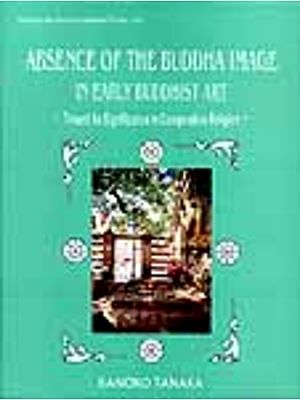 One important reason of this late beginning of the study of the subject may be attributed to the fact that most of the scientific studies of modern times have originated from the west and western people until recently entertained such a sense of supremacy in their head and heart regarding their own religion that they hardly thought it worthwhile to compare it with the religions of the east. Consequently, they did not see the necessity of undertaking any study of religions other than their own. Even when they sometimes did so, they did it only with a view to exposing the weak points of those religions so as to belittle their importance and, in contrast, to exalt their own: But this is not the right spirit in which a comparative study of the different religions can be made. Such a study requires an impartial, neutral and tolerant outlook and if at all there is any leaning or sympathy for any religion, it must be for religions other than one's own. The attitude of India has always been one of tolerance and respect for other religions and the Indian people have never regarded themselves as the "chosen people of God." Attempts at comparative study of religions have been made in India since very old days, but due to political subjugation that she had to suffer for long, her voice was not recognised and cared for in the family of nations. It is not only on a theoretical level that India has recognised the value and worth of other religions, but also on the practical level she has set exemplary evidence of her tolerant attitude. by accommodating many foreign religions of the world on her soil from time to time. She has always taken the various religions of the world as nothing but the different ways, suited to the cultural' environments of different people, leading to the same goal. As Parriender has very nobly and honestly recognised, "India is used to many religions and regards them as different ways to the one goal with a rare tolerance."! It is only when a few saner western thinkers have begun looking to eastern faith as certain valuable heritages of mankind that the western people have realized the need and importance of a comparative study of religions and a science of comparative religion has consequently come about. Moreover, when the modern scientific developments have made world in a sense very small such that mutual contacts among various cultures have become inevitable, the westerners have to recognise the existence and value of religions other than their own also. And thus comparative religion has now become an important subject of study and research amongst students, teachers and scholars of the world.